The ¡SUPER SKETCH! series is a hookup between artists and musicians organized by SUPER C۞L۞R SUPER. Every event brings the artists, the bands, the audience and the party together through the prism of a special concept . Super Sktech has been running in Seoul and thanks a lot of audiences support, Super Sketch is gaining influence on the larger community. The Super Sketch includes the various contents with art market which sells artist’s art work. Visual Art on multiple screens on stage in the time live music going on. Using vintage anlogue OHP projectors , artists express their own color by live drawing. This experimental and unique Supersketch concert is now coming to Busan. 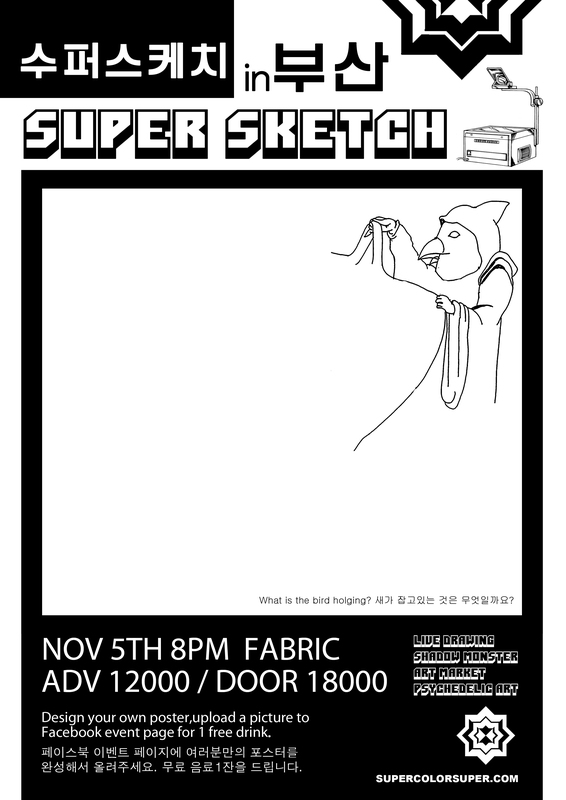 Hope you have a interest in the first Supersketch of Busan organised by Supercolorsuper’s enthusiasm for local concert. 수퍼스케치는 SCS가 시리즈 공연으로 진행 중이며 아티스트들과 뮤지션들의 만남이라는 컨셉으로 아티스트, 밴드, 관객이 모두 함께 하는 파티이자 아트퍼포먼스입니다. 이미 네 번이나 서울에서 진행된 시리즈 공연으로 매번 약 400 명의 관객들의 호응을 얻으며 절찬리에 진행되었습니다. 뮤지션의 공 연이 진행되는 동안 15명 정도의 아티스트들이 라이브로 그림을 그리는 아트 콘서트로 공연을 찾은 관객들은 라이브 공연 감상은 물론 라이브 드로잉을 관람하며 창작의 순간에 보다 적극적으로 참여할 수 있는 경험을 맛보게 됩니다. 또한 아티스트와 디자이너들이 제작한 작품을 구매할 수있는 아트 마켓을 진행함으로써 아티스트들에게 그들의 작품을 관객에게 알리는 기회이자 관객들은 아트 제품을 저렴한 가격에 구매할 수있는 기회를 제공하기도 합니다. 수퍼스케치 는 국내 각종 미디어는 물론 해외의 아트 매거진에서 취재를 하는 등의 많은 관심과 집중을 받고 있는 로컬 시리즈 기획입니다. 개성 넘치는 수퍼스케치 공연이 드디어 부산으로 갑니다! 입금후 scstickets@gmail.com 로 아래의 내용을 보내주세요. 공연에 오시는 분들에 한해 무료 음료 한잔을 무조건! 드립니다. DRAW YOUR OWN POSTER- Download or take a copy of the poster, complete the drawing and upload to this page for a free drink and, we are going to print a 2 meter tall version of the best entry and display at the KSU on November 5.